The stars of this helping of sleek sync set their own pace, whether that’s supernaturally fast, a doomed and dogged shuffle or a slick and steady cruise. Meanwhile in the advertising world at large, the start of summer proper has seen brands train their crosshairs straight on the heart. Ireland’s Road Safety Authority, who tend towards the traumatising (though not as vicious as the notorious DOE) in their road safety campaigns, eschewed road accident gore for no less visceral horror. In lighter fields, Airbnb and Youtube celebrated Pride in heartwarming style (and Fairy non-bio broke paternal hearts everywhere for Father’s Day), while McDonald’s got awkwardly cute and Lloyd’s milked the Black Beauty angle with the help of sweet-voiced teen songstress Birdy. Coca Cola pulled the name labels on its cans to encourage middle eastern consumers not to label each other, and Scope brought Nabil on board to direct a more sensual anti-prejudice spot for National Kissing Day. James Murphy’s (probably doomed) subway project with Heineken provided simpler smiles, while in terms of sheer daft laughs, Strongbow fired Patrick Stewart, and Rightguard started the day off, well, right. Low-powered hobby boating is a pastime with few iconic action heroes, but here one presents himself – the star of alcohol awareness foundation AV·OG·TIL’s spot has a hint of whatever’s comfortable to his schlubby self-possession, and his triumphantly butter-smooth dock in the face of snooty, slightly sozzled rivals is a little joy powered by the swagger of his soundtrack choice: a wah-wah heavy Hendrix remix. Just about every speed-suggesting trick in the visual editing book seems to be on display in this vigorous, choppy spot – assuming you can catch it. Fleet-footed stars from all walks (or rather sprints) of sporting life, from Serena Williams to Kobe Bryant, do what they do best – fast. The auction segment rather breaks the rhythm, but the muscular drums, bold brass and apt lyrics of Eli “Paperboy” Reed just about pull it back. 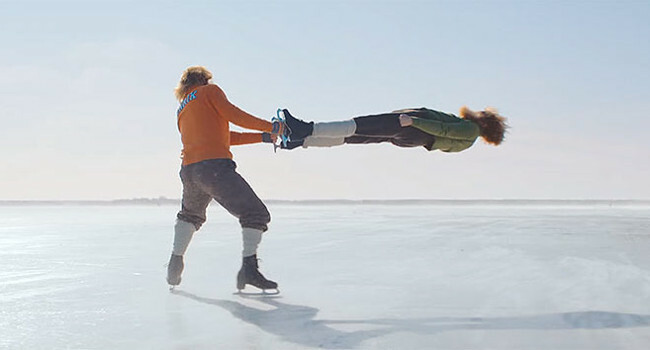 Rekorderlig’s latest in its ‘beautifully Swedish” campaign is perhaps the most compellingly bizarre installment thus far, and utilises Epic Split director Andreas Nilsson’s facility for majestic daftness – a duo of heavily bearded swedes perform figure skating feats at odds with their hulking Viking forms and silver-streaked appearances, while their tracksuited coach looks on with mad-eyed fervour. The earnest spirituality of his accompanying ballad, ‘Reindeer Herder’ from Sami Sweden’s got talent sensation Jon Henrik Fjällgren, is the perfect accompaniment both to the duo’s preternatural gliding and their coach’s straight faced passion. Crisply kooky. A bit of a look back at an ad whose wish was abundantly granted this summer. The tatty teddies and baubles attached to long-distance lorries seem doomed to a rain-soaked and miserable existence, and this bedraggled duck is no exception. But the tables turn with the weather, and the sweet swing of comedy duo Morecambe & Wise’s take on ‘Bring Me Sunshine’ puts a very English smile on this spot’s face. A spoof documentary piece (carried as far as cinema website Allociné) focusing on a particularly luckless yet in-demand actor who has supposedly died onscreen more than any other. (Various actual estimates put this dubious honour on the head of differing actors, from John Hurt to the late, great Christopher Lee, and rather more firmly on the head of veteran stuntman Seizo Fukumoto.) The main thrust? This makes him the ideal spokesman for organ donation. It’s a little oblique and a lot dark. But awkwardly translated title aside, there’s a blackly comic, 70s-tinted fun to the whole vehicle, helped in no small part by the breezy, tambourine-festooned verve of South Korean idol Jung Hoon Hee’s 1970 hit ‘He’s An Idiot’. A beautiful couple take off to (every single) destination of their dreams – so far, so typical. But it’s the joyful visual trickery and energy of this lastminute.com spot that sets it apart as the duo dance, dream and dash about together – not to mention the on-point soundtracking. The distinctly groovy, Afro-mod Kenyan flair of Sal Davis’s ‘Makini’ powers them through their adventures.